A motorcyclist miraculously survived after he crashed into a dump truck on Saturday and was immediately engulfed in flames. 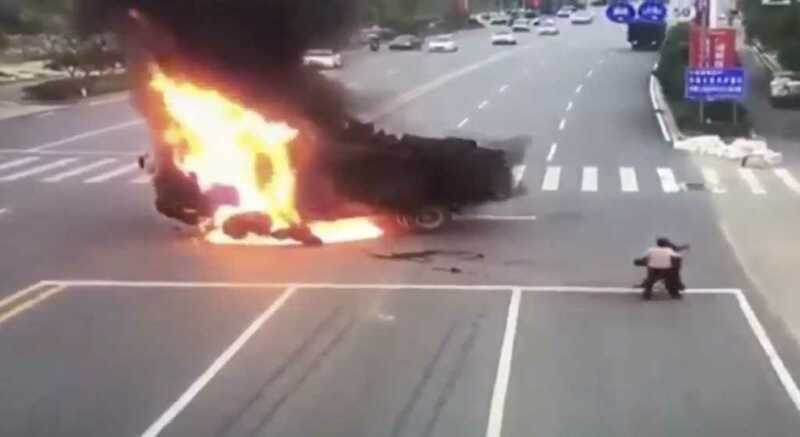 Surveillance footage of the collision, which unfolded in China, shows the man’s motorcycle hitting the truck’s fuel tank, with an uncontrollable fire subsequently breaking out, according to Channel News Asia. Video of the incident shows the motorcyclist stopping, dropping and rolling around on the ground after crash, as good samaritans rushed over to help pat down the rest of the flames covering his body, Fox News reported. What could have been a deadly situation ended up concluding with doctors reportedly saying that the motorcyclist didn’t have any life-threatening injuries. Police reportedly later said that the motorcycle driver was moving too fast and that he was unable to stop before colliding with the truck. Thankfully everyone walked away relatively unscathed.